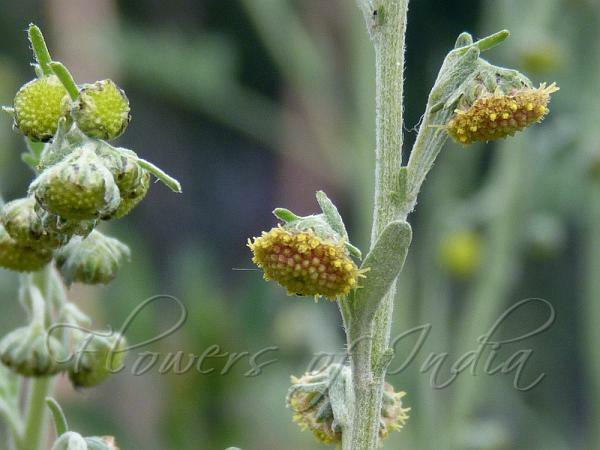 Large-Flowered Wormwood is an annual herb, up to 20-30 cm tall, densely whitish-grey hairy, with 6-8 cm long, well branched root. Stems are several from the base or solitary, erect to ascending, ribbed, with 1.5-3 cm long internodes. Basal and lower stem leaves are carried on 1.5-3 cm long, winged stalks. Leaves are broadly ovate to round, 1.0-1.5 x 1.0-1.5 cm, bipinnately cut into linear-oblanceolate, 2.5- 4 x 0.5-1 mm, apically obtuse ultimate segments; medium and upper stem leaves subsessile to sessile, gradually reduced in size. Flower-heads are remote, in simple, 10-12 cm long racemes, hemispherical, usually 0.6-1 cm across, nodding. Lower peduncles are slender, 8-12 mm long, upper ones smaller, curved. Involucre 4-seriate, outermost phyllaries linear-oblong, (3-) 4-5 mm long, densely hairy, obtuse; median phyllaries narrowly obovate, 3-4 x 1.5-2 mm, green and densely hairy to glabrescent on midrib, scarious-membranous alround; innermost ± elliptic-obovate, 3.5-4.5 x 1.75-2.5 mm, obtuse, scarious, glabrous. Receptacle is hemispherical, 2.5-3 mm in diameter, densely hairy. Florets are numerous, all fertile, greenish-yellow; marginal florets female, eligulate, with c. 1.5 mm long, 2-toothed, basally broadened, glandular corolla, style branches exserted; disc-florets bisexual, with 5-toothed, densely glandular, c. 2 mm long, tubular corolla, anther appendages acute, protruding. Cypselas narrowly oblanceolate, 1-1.5 mm long, light brown. 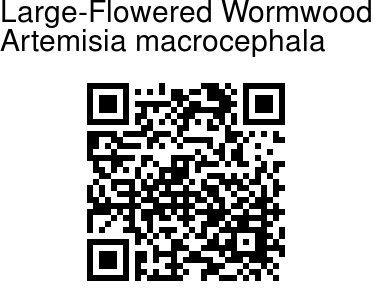 Large-Flowered Wormwood is found in China, Mongolia, Tibet, Russia, India, Pakistan and Afghanistan, at altitudes of 3400-5500 m. Flowering: June-September.